BEIJING, Feb. 1 (Xinhua) -- Chinese President Xi Jinping met with visiting British Prime Minister Theresa May Thursday, calling on both countries to forge an enhanced version of the "Golden Era" bilateral ties. During their meeting at the Diaoyutai State Guesthouse, Xi said peace, development and win-win cooperation have been the mainstream of the times with the development of a multipolar world, economic globalization, cultural diversity and great IT applications. The two countries need to conform to the trend of the times, respond to the needs of their respective development stage and bilateral cooperation, and add new meaning into the bilateral ties so as to forge an enhanced version of the "Golden Era", Xi told May. China and Britain agreed to embrace a "Golden Era" for bilateral relations during Xi's visit to Britain in October 2015. Xi said that China is willing to work with Britain to promote the healthy and steady development of bilateral ties in a new era. He made four proposals for the future development of bilateral ties. Firstly, the two countries should consider and design the future development of bilateral ties from a strategic height and in a comprehensive way. Xi called on both countries to continue to host high-level dialogue in areas of strategy, finance and people-to-people exchanges, and strengthen exchanges between the legislature bodies, political parties and militaries. "The two countries need to enhance mutual understanding, respect and consider each other's core interests and major concerns, and deal with sensitive issues in a constructive way," Xi said. Secondly, both sides should work together to promote bilateral economic and trade cooperation. He encouraged both countries to dovetail strategies, enhance cooperation in areas of finance, nuclear energy and investment, and explore cooperation in new areas such as artificial intelligence, green energy, the digital economy and sharing economy. China supports economic globalization and trade liberalization, the president said. The Belt and Road Initiative, a public, transparent, open, inclusive and mutually beneficial initiative, is operated under market rules and international rules in the principle of wide consultation, joint contribution and shared benefits, Xi said. "China and Britain can carry out broader and more in-depth cooperation of higher standard within the framework of the Belt and Road Initiative," Xi said, referring to the initiative he proposed in 2013 that aims to achieve policy, infrastructure, trade, financial and people-to-people connectivity along and beyond the ancient Silk Road trade routes. Thirdly, China and Britain should enhance exchange and cooperation within multilateral institutions such as the United Nations, G20 and the World Trade Organization to address global challenges including climate change. Fourthly, the two countries should reinforce people-to-people and cultural exchanges to set an example of realizing harmony and coexistence between eastern and western countries. Echoing Xi's comments on Sino-British ties, May said Xi's visit to Britain in 2015 promoted the in-depth development of bilateral ties in various areas. "Britain shares similar views with China on many global issues and values China's role in international affairs," May said, adding that Xi's speech on globalization at the World Economic Forum annual meeting in 2017 was warmly welcomed by the international community. 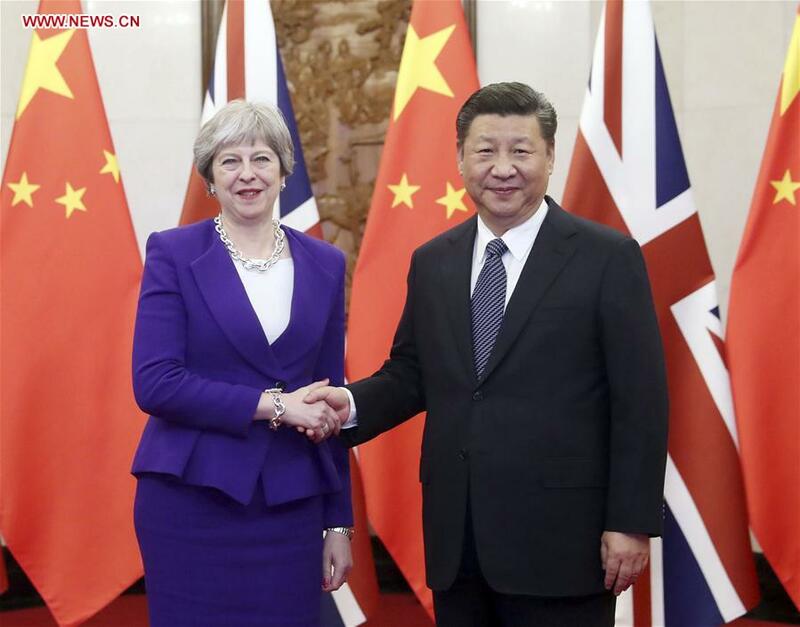 Saying the Belt and Road Initiative has far-reaching global influence, May expressed her hope that Britain and China can cooperate in this regard to boost global and regional economic growth. May said that as a defender of free trade, Britain is willing to cooperate with China in areas of trade, investment, science and technology, environment, culture and Internet, as well as intensify coordination on major global and regional issues and jointly promote Britain-China global comprehensive strategic partnership for the 21st century. Earlier on Thursday, China's top legislator Zhang Dejiang also met with May. Zhang, chairman of the National People's Congress Standing Committee, expressed willingness to enhance exchanges between the two legislative bodies to ensure a sound legal environment for pushing forward economic and trade cooperation, and cementing cultural exchange. This is May's first official visit to China since she took office in 2016. She kicked off her three-day visit to China in the central city of Wuhan Wednesday morning and held a China-Britain annual meeting between heads of government with Chinese Premier Li Keqiang in Beijing Wednesday afternoon. The two countries signed a dozen deals in areas including trade, finance, health care and smart cities on Wednesday.